Just finished this one up today. DECALS: Powerslide. Slixx screen decals for grill screens. Buick on air cleaner was from a JNJ sheet. BUILD NOTES: Very nice resin body made this an easy build. Just a little wet sanding and a good scrubbing using warm water and Dawn dishwashing detergent. Chassis is straight from box. Beautiful Powerslide decals. I did have to double up on the #22s because of a little bleed through. 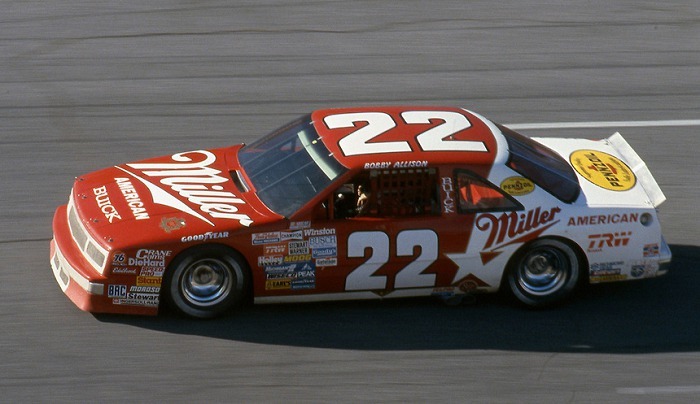 PERSONAL NOTES: I was at Talladega when Bobby almost got this car into the grandstands. This was also Davey's very first win. Entire field qualified over 200 MPH. The cars were averaging around 210 MPH during green flag laps. Just an incredible sense of speed! Really enjoyed this build. 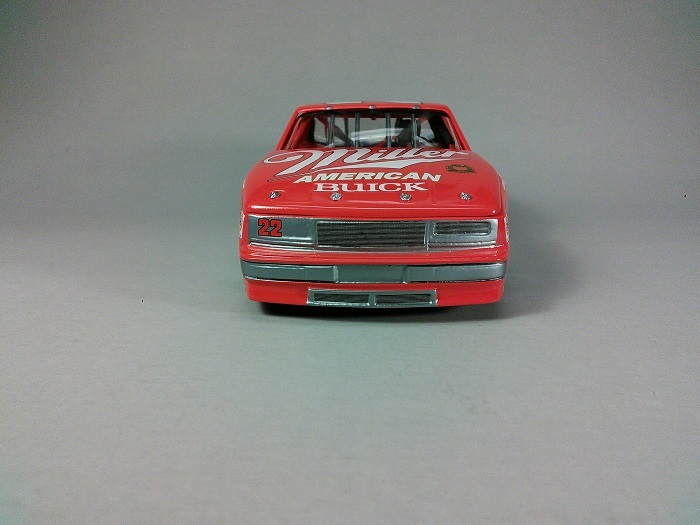 Having this resin body really helps put another Bobby Allison build into the collection. I had a brain fart and placed this in the modeling discussion forum and not in showroom. Doh!! Man!!! does that car bring back memories. That was one beautiful hot rod. That is an outstanding build by the way! Mighty pretty. Beautiful build BW!! I'M NOT CRITISIZING by any means, but, is the hood supposed to sit up that high by the windshield or should it sit more flush? And the rear panel looks almost flat. The reason I'm asking is because I'm starting Allison's Piper conversion and I have no clue what I'm doing . The conversion, especially in the rear panel sticks way out on my molded pieces, should I sand it more flat like yours? Mack, you're welcome to chime in and so is anyone else that knows. I got this kit before the resins came back into production so I'm sticking with it. Super build Bobby! Really outstanding. I remember watching that race and sitting in my living room in stunned silence. Had Bobby's car been a few feet higher, he would have gone into the crowd and racing would have been changed forever. Sometimes the resins hoods will set a touch high. If you file too much off in one area, you'll find yourself gluing strips back to it to fill it back in.Best thing to do is find a spot where you like it. 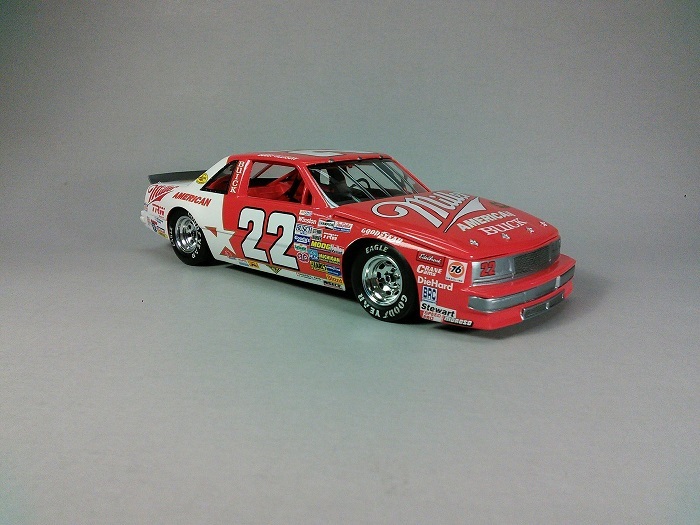 The last Lesabre I built, I glued the hood down. Dern thing kept falling off of one side or the other. The tail on Bobbys build looks spot on to me. I'd be proud of that build. It's a beaut!!! Very nice clean build Bobby. Those bodies take some TLC to look good and you did awesome. That is one of the tougher B.A paint jobs and you nailed it. Excellent.. one of my favorites. Hey Dave. Thanks for the compliments! The hood on this particular car has always been a trouble spot. I actually had the hood on this one looking pretty good and sitting flush but when I glued the body to the chassis the front fenders or maybe the entire front clip kinda went "Katie-wonkered" on me. It warped enough that the hood didn't fit flush as it had before attaching body. (So much for trial fitting.) I CAREFULLY heated the hood using warm water. I got it a littler better but just didn't want to push my luck and mess up a good paint job and decals. It still sits a little high at the back at the base of the windshield. As far as the rear panel, this resin body is pretty close if not actually 100% accurate. I went back and looked at a few photos of the real car (not any real good photos of the rear end) and this resin body really looks accurate. The only thing I would do different would be to attach the rear bumper and fill all the seams before primer and paint. Again the body warped a little after attaching the body to the chassis causing the rear bumper not to fit as flush as I would have liked. Hope this answers your questions but if you have any others don't hesitate to ask. Thanks R.J. Yes resin bodies can be a pain in the rear but this one is one of the better ones I've built. Still had to deal with a little warping but the end result turned out fine and looks good in the BA collection. The paint job really seemed intimidating and kept me from building this one for a while. The separation line around the stars seemed to be the most worrisome area. The thing that helped was that I made a copy of the decal sheet and used this as a guideline for masking. I painted the white areas first then taped the decal copies to the body using drafting tape then carefully masked using Tamiya tape. Took a while and I had to re-do the masking several times until I was happy with it then airbrushed the Tamiya TS-49 on. I really like the results. Just takes time and patience. Thank you Bobby, I'm running into the same issue, there just isn't any real good rear car pics out there. I think I will take your advice and do the chassis first, then sand/trim body and hood when it's snapped together. If I could bother you to maybe add one or two more pics of the back of the car of yours? Or pm me and I will give you my phone number and maybe text me a few pics? I did a fiberglass layup over my hood mold so mine might be a little thicker so it sits better(according to Mack). Thank you for the advice/tips guys, I really want to do this build right. Bobby would this kit work? I know the front grill is different and not sure about the rear or the rest of the car. I really don’t know the big differences between the 87 and 88 body style. I too am looking to do this one as well and I’m looking for an alternative to a resin body. I was thinking with some front grill modification I could make this kit work. Then again it may not even be worth the time. 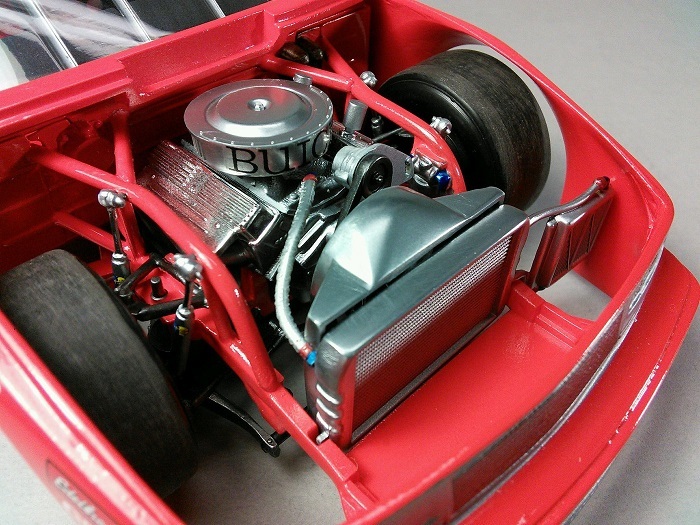 The kit body shown above would not work, as it is the 1988 Buick Regal, a completely different body. The chassis might work, though I haven't eyeballed it with the Monogram 1987 Olds body, which is essentially the same as the 1987 LeSabre resin body used in this thread. 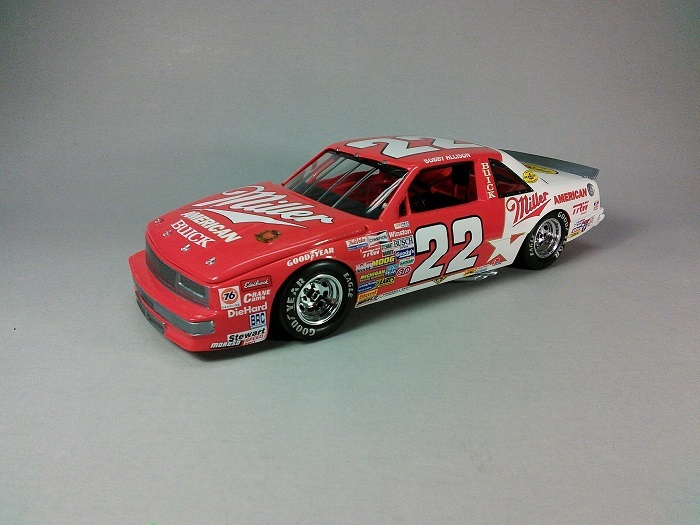 Look for the MG Lake Speed Wynns or Cale Yarborough Hardees 1987 Olds kit, as the Olds and Buick shared the basic body and greenhouse. George Andrews is exactly correct. The car in your photo is the 1988 Buick which is a completely different body style. If you wanted to build a '86-'87 Buick and NOT use the Powerslide resin body you would have better luck using the Monogram Hardee's or Lake Speed Olds kit. 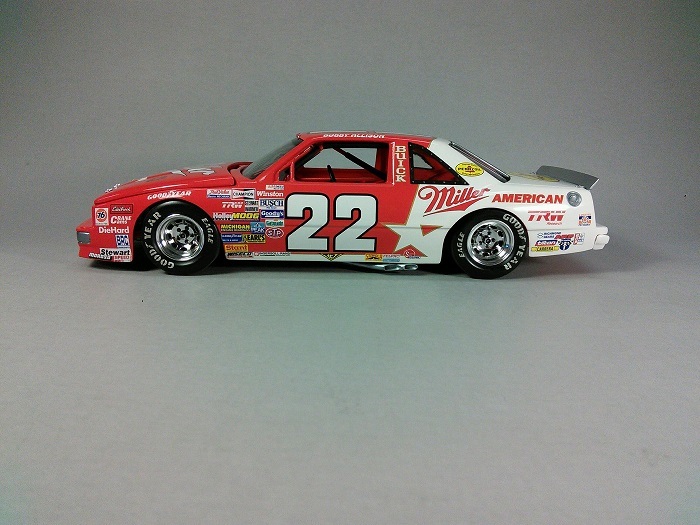 This is what the '86-'87 Buick resin body is based on. 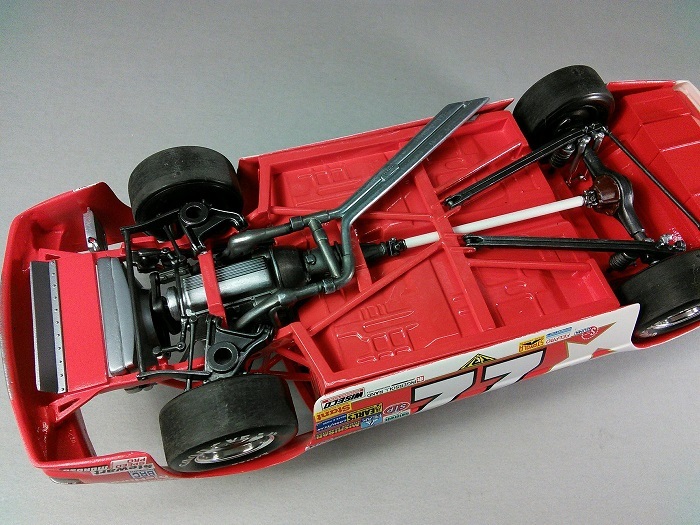 The '88 chassis could work with the '86-'87 Buick Powerslide Resin body (the one I used.) 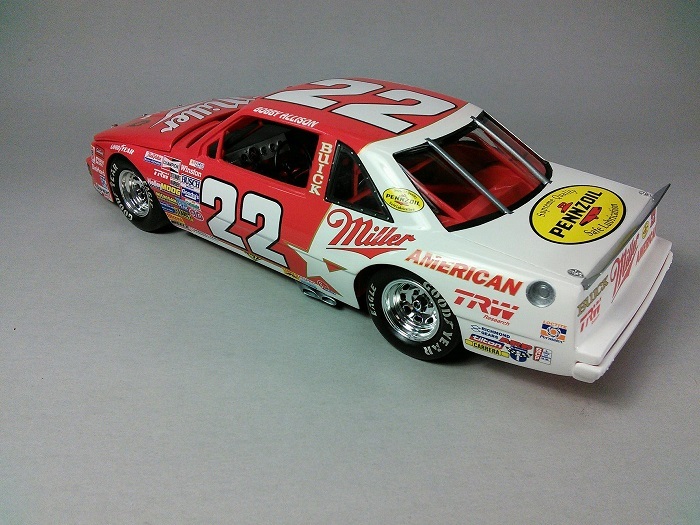 BTW, that Monogram '88 Buick is a beautiful model kit and using the Powerslide decals would build into a beautiful replica of Bobby Allison's last ride. Hope this helps. Thanks Bobby.. I may do just that and build the 88 gold car. I always really liked that car too...such a shame he spent only half a year in it. They are correct I.M. You need the Hardees kit and a conversion kit. As I'm finding out they send you thin pieces of plastic mold to use and you're supposed to fill in the molds and sand as required for fit. I'm having a hard time finding clear rear pics to accurately see how the back fits. I decided to fill the hood mold and use it to do a 3 ply fiberglass layup so the hood is thicker and at the same time made a radiator shroud the same thickness. You're better off going with the resin, Mike has 2, well 1 now because I asked him to hold one for me. I consider myself a pretty experienced modeler(built around 150-160 NASCAR models) and I'm having all kinds of fits with this thing. Hope this info helps you out. Another beauty Bobby. Love seeing your builds.